The cost of processing administrative transactions associated with health insurance claims is part of doing business as a healthcare provider and a health plan. During the last fifteen years, HIPAA has established standards for conducting many of these transactions electronically. The Affordable Care Act introduced Operating Rules that are making these transactions mandatory for health plans when providers request them. In 2013, the claim status transactions (276/277) and the eligibility transaction (270/271) became mandatory standards. 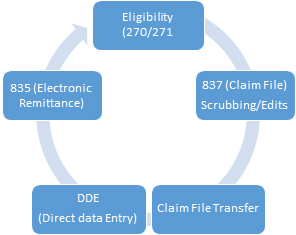 In 2014, the 835 electronic remittance and the EFT became available to any provider requesting them from a health plan. In addition, the ACA requires that these payment transactions occur within three days of each other and that standardized codes are used for certain types of adjustments and remarks. Even though these transactions are available, a provider cannot take advantage of the savings associated with these transactions without information systems capable of executing them with health plans, either directly or indirectly. Like many other cost saving opportunities, they begin with an initial investment that may actually increase your cost in the short term, but provide long term benefits. In order to calculate the financial benefit of implementing any of these processes, you will need to determine the cost of implementing a solution and the savings that the solution would provide. The cost of implementing solutions is relatively easy to determine. You can identify vendors that offer solutions for providers to conduct these transactions and calculate the cost of implementing these solutions, including training, IT resources, transaction fees, etc. The benefit is more difficult to determine ahead of time. CAQH (The Council for Affordable Quality Healthcare, Inc.) has assumed the role of developing these processes for the benefit of the industry with the goal of reducing the excessive administrative costs still prevalent in healthcare. They provide many useful tools for providers that can assist them in implementing these transactions with health plans. See their web site, www.caqh.org. Some highlights of the study include that claims submission had the highest rate of automation at 91%. Eligibility offers the biggest saving opportunity, CAQH calculated an administrative cost of $3 each when these transactions are conducted manually. Over 40% of claim payments are still made by check and only 53% of remittances are electronic, both representing significant savings opportunities for providers with a minimal investment. CAQH has provided a handy online calculator that can be used to calculate your potential savings for each of the six transaction types (listed below) based on the savings calculated in this study and the number of transactions, by type, that you conduct manually at your organization. If you would like to estimate your potential cost savings click below! Figure out where your opportunities are and take action. MEDTranDirect can assist you with these processes through web-based applications that can bolt on to your existing automated and manual processes to implement these savings at a minimal cost. Submitting claims and encounters electronically is easier than you think. It can be done with minimal cost and time. All you need is a computer with internet access. Get started today. MEDTranDirect can help: from the creation to receipt.